The people of the farming community of Roka in Cambodia are living through exactly the nightmare scenario that the World Health Organisation wants to stamp out with a new policy on syringes. And there is one common factor that links them, directly or indirectly: nearly all of them received injections from an unlicensed doctor suspected of re-using his syringes. Every year, millions of people around the world are infected when syringes are used on more than one person, not only spreading HIV but also Hepatitis B and C, and other diseases. The WHO's hope is to try to achieve a global switch to what are called "auto-disable" syringes that are designed with a feature which effectively breaks them once an injection has been given. But for the people of Roka, all that is too late. Looking tired and desperate, with her four-month-old daughter Tola on her lap, Yong Sothom described to me how she became infected with HIV and then unwittingly passed on the virus through her breast milk. "I feel sad, very very sad," she said, "because it's a pity for my child - she is innocent yet she is also infected." For her, the outbreak has become almost apocalyptic in that it has stretched across four generations of her extended family, hitting no fewer than 19 relations. The family's matriarch, 76-year-old Chay Yao, spoke with great dignity and determination as she tried to convey the scale of the tragedy that has struck an otherwise calm existence. "It is not like a normal sadness, it's so difficult, especially for these small children. "It's no worry for me to die but I feel pity for the children about their future, about how they will make a living, how they will get food, this is what I am thinking about." So, amid the soaring temperatures and dust of the dry season here, a sombre mood has descended over a community wholly unprepared for what has developed into a national health crisis. Most of the victims, including the abbot, Mom Heng, have now been prescribed anti retroviral drugs but, in an effort to head off panic, he's been working with a local charity to persuade people not to worry. We travelled with him to one particularly unfortunate family where the mother and four of her five children are all infected with HIV. The father, Sokhaa Vech, a local chief, recalled seeing the unlicensed medic visiting a neighbouring family before coming to his, and he noticed how the man handled his equipment. "The syringe was in his bag," he told me. "He pulled it out of its plastic wrapping, gave an injection, put it back in its wrapping - and then I saw him using it again on everyone else." The medic, Yem Chrin, was by all accounts a popular figure in the area, dispensing injections at a far cheaper price than charged by the local government clinic and prepared to make home visits. We also heard that he offered his treatments on credit and was content to be paid in commodities such as rice. One charity worker described him as "uncle easy", and the abbot and Chay Yao, the matriarch of the family with 19 victims, are among those to emphasise his attentiveness. Since the crisis started, Chrin has been in custody and now faces an array of charges including murder. One striking feature of this outbreak is how the villagers are evidently keen on injections, preferring them to pills, often receiving dozens of jabs for ailments such as dysentery and fever. This is a cultural phenomenon - not just in Cambodia but in many developing countries - in which the technology of a highly visible procedure is sought after, and the risks are probably not considered. This is the reality facing campaigners who have long argued that the safety of syringes is pivotal to cutting infection rates. With us on the visit to Roka was Marc Koska, the British inventor of a type of syringe that is disabled once used. 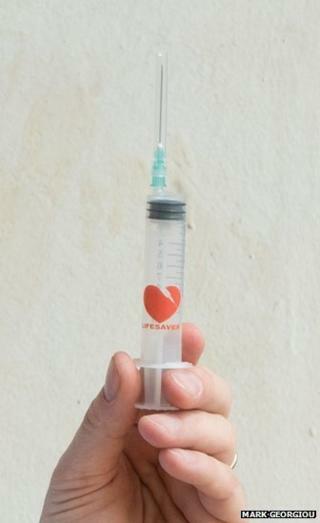 For years, through his charity SafePoint, he has argued - with health authorities, at conferences and in the media - that the world needs to ditch the standard kind of syringe because it carries too many dangers. When we encountered a team of medics sent in from the capital Phnom Penh to help cope with the outbreak, he had a chance to demonstrate how his system works. Marc unwrapped one of his syringes, depressed the plunger as if giving an injection and then, when he tried to pull the plunger out, showed how it snapped - making reuse impossible. The medics, all specialists in HIV/Aids, were amazed and immediately saw the benefit. One of the team, Te Naisam, smiled at the sight and said: "I've never seen this before. I've been a nurse for more than 20 years and I've just seen today this modern syringe. "If they are available, imported into my country, it would be very good to help reduce the HIV/Aids infection." In fact these auto-disable syringes have been in use for international immunisation programmes for the past decade and a growing number of companies produce them. But immunisations account for less than 10% of the estimated 16 billion injections given globally every year - so the real challenge is to persuade the manufacturers and national governments to agree to work towards a total switch. Marc Koska said: "What's happening here in Roka should just never have occurred. "I've got a design and there are other designs for safety syringes that you simply cannot use more than once. And they're the same price as a normal needle and syringe. "We've just got to get on with this and then we can stop any similar outbreak around the world." Our final stop was at the home of the man at the centre of the crisis. Yem Chrin's shop was closed up but his sister-in-law agreed to fetch a copy of his driving licence so we could see his picture. She then revealed something none of us had heard before: that she was among those infected with HIV, along with Chrin's mother-in-law and grandson, presumably treated in the same way as all the others. The plight of the grandson seems especially poignant: an innocent in a crisis, infected in his own home, and all because of something as simple as a dirty syringe.